Videos between the text – one video showing the interview with Prof Yan Xuetong of Beijing’s Tsinghua University and the another one with Philippine Foreign Ministry spokesman Charles Jose. Pictures next to the text – The first map showing the nine-dash line , an map showing the Spratly Islands and another map outling the first and second island chains. 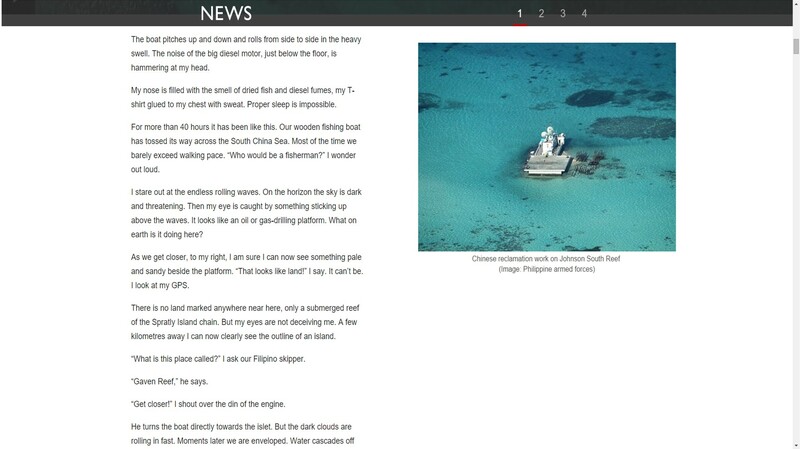 Text – introduction of Pagasa, a tiny island with Filipinos living on it. Text – interviews and experience on Pagasa. Text – the experience on the ghost ship with interviews of the patrolling soldiers. This digital story is successful with a number of reasons. To begin with, it made good use of the images and videos to supplement the text. 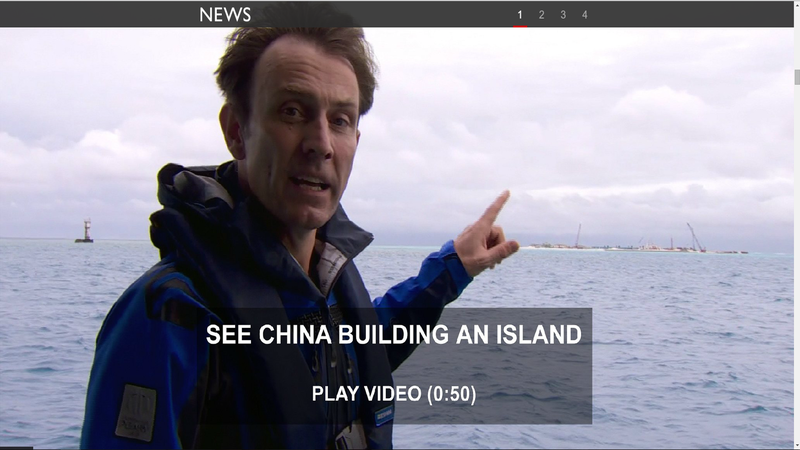 BBC News provides information in different platforms, including online, television and radio. 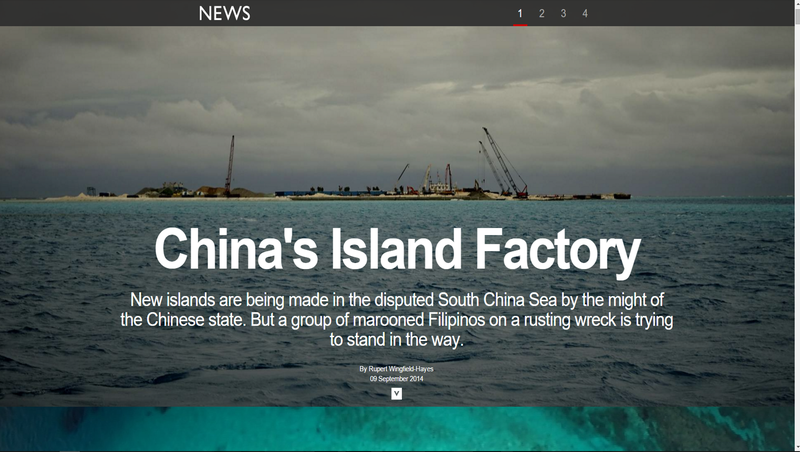 The digital story combines the essence of different formats to illustrate the full picture of the South China Sea controversy. The images and videos appearing in full size demonstrate their importance in the story. Not only to supplement the text, the visual materials can arouse readers’ interest to scroll down the page and keep reading the story until the end. 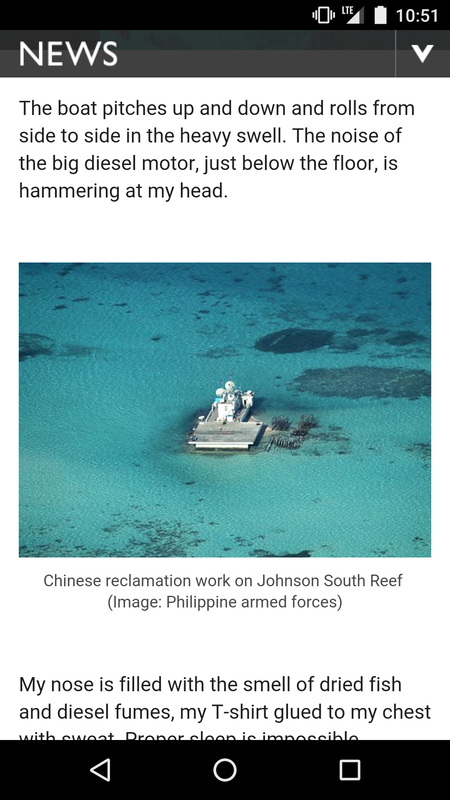 As South China Sea controversy is not an easily understandable topic, the way the story told can also give readers better understanding on the issue. The interactivity of the digital story provides readers an option to know more about the details. For example, a reader needs to click on “play” button of each video in order to have the video played. If the reader does not have enough time, he or she can simply skip the video and just read through the text. The story is divided into four parts. It is good to have a cover picture for each part of the story. In addition, the numbers 1-4 on the top-right corner of the page can help reader to navigate to different sections anytime. This also gives reader the option not to read the whole story in order. The way to illustrate the pictures next to the text is a good way to tell the story. Readers would not feel interrupted when they scroll down the page as the picture is on the right hand side of the text instead embedded between paragraphs. This provides a good reading experience for readers. However, this can only be done using a desktop computer will full-screen browser. If the story is shown on a smartphone or tablet, the pictures would appear between paragraphs. Thus, readers cannot read the text continuously without interruption in this case. Some of the content is considered a bit too much. 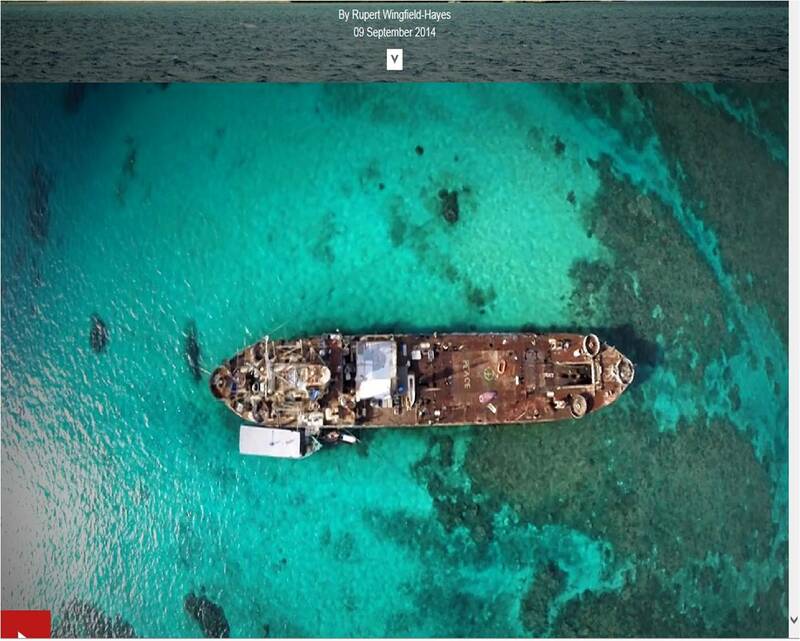 For example, the aerial view of the ghost ship at the very beginning of the story is not essential. Though the first paragraph of the introduction mentioned the ship, the main content of the ship is in the last part of the story. Thus, I think it is possible to remove the video of the aerial view at the beginning so that the readers can go straight to the text.